Dredging for volcanic rocks on the ocean floor is a crude sampling method of doing Earth science, and success can often arguably be attributed to “pure dumb luck.” However, since each dredge takes hours to complete, and we have so many sites to visit, it is important that we determine optimal dredging locations that will most likely provide the rocks we are looking for. To help us in our decision-making, we employ the Melville’s Kongsberg EM122 multibeam echosounder. The EM122 is a swath sonar that allows us to make three-dimensional bathymetric maps of the ocean floor by gridding the hundreds of individual depth soundings the instrument records when it sends out a “ping.” Depending on water depth (between 1 to 5 km) the sonar pings every few seconds, illuminating a swath of seafloor beneath the ship that can be many kilometers wide. When we are dragging the dredge basket over the seafloor, we are hoping to encounter bare volcanic rock rather than sediment or manganese crust. It is also better to get a good “bite” and break off a chunk of a lava flow, rather than scoop up fallen debris, which may be more altered and/or brecciated. The ideal sample would be a hunk of unaltered seamount basalt with large phenocrysts to be used for radiometric age-dating and isotope geochemistry. Areas with large vertical relief and steep topography generally shed sediments and are likely to expose bare rock. 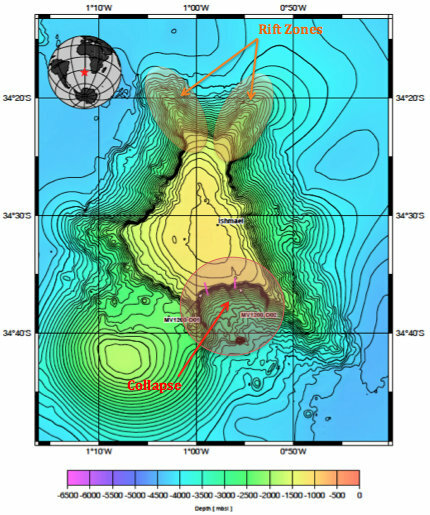 Similarly, fault scarps, fracture zones, and recent collapse features (mass wasting scars) are likely to expose material that formed as part of the main shield-building phase of the seamount, rather than products of late-stage volcanism, which normally appear on the exterior flanks of the seamount. Rift zones extending away from the main flanks are also good candidates, as they generally provide good relief and fresh volcanic terrain. Some of these features are shown below on the recently mapped “Ishmael” Guyot. The EM122 not only records depth information, but it also records the intensity of the returning sound signal after it has reflected off of the seafloor. This property, known as back-scatter is analogous to side-scan sonar, and can also be used to characterize the seafloor. Soft sediment cover attenuates sound energy very well, and therefore the sonar records weaker returning intensities, which appear lighter when plotted on the map. Rougher surfaces and rocky outcrops provide stronger reflections, which appear darker on the map. The steep rim of the collapse on Ishmael is a good example of such a reflective surface, in stark contrast to the sediment-filled basin at the base of the escarpment. Unfortunately, manganese crusts are also highly reflective, and indistinguishable from the basalt that lies beneath it. Hopefully this will become less of an issue as we move on to younger seamounts along the most southwest portion of the Walvis Ridge. Using high-resolution bathymetric imagery and corresponding backscatter, and of course the experience of our PI’s and still a fair bit of “pure dumb luck”) we have now successfully retrieved 15 dredges from the ocean deep. We look forward to sharing more as we move westward along the Walvis Ridge. Merged multibeam bathymetry and satellite altimetry map of the “Ishmael” Guyot. Warmer colors represent shallower depths, while cooler colors represent deeper basins. 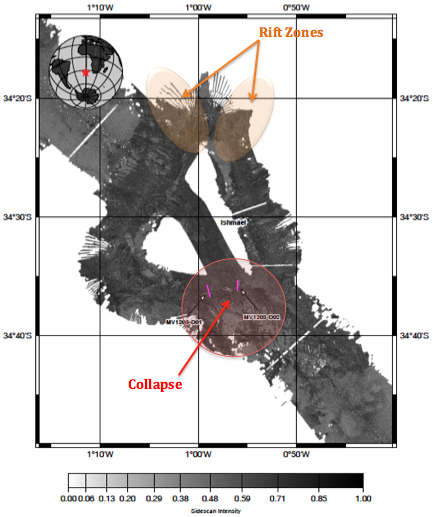 Note the two dredge transects (MV1203-D01 and D02) along the rim of the collapse feature, as well as the prominent rift zones extending away from the main flanks. 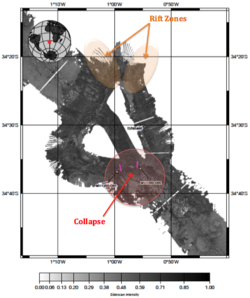 Back-scatter intensity map of the “Ishmael” Guyot. Lower intensities are displayed in light colors, and higher intensities are displayed in dark colors. Although, data coverage is not complete, you can still note the dark, reflective rim of the collapse feature, compared with the softer sediment-filled basin below it. The partially mapped rift zones also appear reflective, likely pointing toward exposed volcanic rocks.